U.S. Secretary of State John Kerry opens talks Sunday in Egypt with his diplomatic counterpart on a range of security issues, as the Cairo government confronts growing terrorist threats in the Sinai peninsula. American officials say Kerry's talks with Foreign Minister Sameh Shoukri aim to relaunch a strategic partnership slowed by U.S. human rights concerns over Egypt's 2013 military ouster of elected President Mohamed Morsi. The two governments have not addressed that partnership in face-to-face talks since 2009. Analysts say Kerry faces the challenge of supporting Egypt's ongoing push against Islamic State-linked extremists, while showing disapproval for Cairo's harsh government policies toward human rights activists, journalists and the political opposition. A senior State Department official who discussed the situation in the Sinai before Kerry arrived said the U.S. needs to support Egypt's efforts to achieve stability. 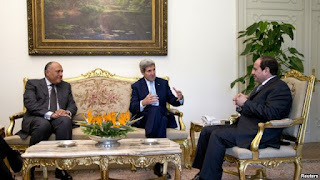 “The real challenge for Secretary Kerry in his meetings in Egypt is how to discuss ... the regional fight against terrorism and the domestic situation in Egypt, and how the two fit together,” said Michele Dunne, a prominent American analyst of Middle East developments. Dunne, who has particular expertise on Egyptian affairs, is a senioir associate at the Carnegie Endowment for International Peace. U.S. and Egyptian officials will also discuss political, human rights and economic issues. 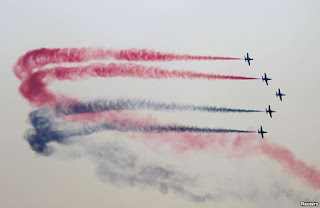 Egyptian Air Force holds an air show displaying F-16 aircrafts delivered to Egypt by U.S., as part of a military package that had been unfrozen earlier this year, in Cairo, Egypt, July 31, 2015. 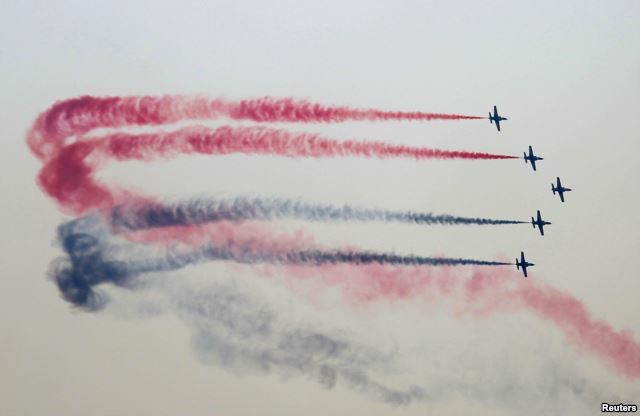 Separately, the United States announced it is delivering eight F-16 fighter jets to Egypt. “The F-16s provide a valuable capability that is needed during these times of regional instability,” said Major General Charles Hooper, a senior defense official at the U.S. Embassy in Cairo. defense official. The senior U.S. official who briefed reporters on Kerry's missin in the Middle East and Southeast Asia said there was no correlation between the secretary's visit and the warplanes deal. In March, President Barack Obama announced the United States was lifting a hold on U.S. military aid to Egypt that had been ordered two years ago, after the country's longtime ruler Hosni Mubarak was toppled by nationwide protests. The U.S. gives Egypt about $1.3 billion in annual military assistance. Despite the resumption of aid, U.S. officials have continued to voice concerns about Egypt’s repression of supporters of former President Mohamed Morsi, who was elected to succeed Mubarak but who was in turn forced to step down under military pressure. From Egypt, Kerry travels to Qatar, where he will meet on Monday with the six-nation Gulf Cooperation Council. GCC members have raised concerns about the deal between Iran and six major powers including the United States. Those six Arab states, all situated close to Iran, have worried that the nuclear agreement with Tehran could have a destabilizing effect on the region. Some Gulf ministers fear that sanctions relief for Iran, which is part of the nuclear agreement, could enable Tehran to widen its influence in the region and broaden its material support for militant groups. Both Obama and Defense Secretary Ash Carter have discussed the Iran nuclear deal with Saudi Foreign Minister Abel al-Jubeir in July. After returning to Riyadh during the past week, the foreign minister said he has concluded it does appear that the agreement will limit Iran’s ability to develop nuclear weapons. The Gulf Cooperation Council consists of Saudi Arabia, Bahrain, Kuwait, Oman, Qatar and the United Arab Emirates – all monarchies. Daniel Serwer, a scholar at the Middle East Institute in the United States, said he is uncertain whether Kerry will be able to ease all of the GCC’s concerns about the Iran deal. However, he also points out the nuclear agreement carries many potential benefits. The U.S.-GCC meeting in Doha also will be a good opportunity to discuss broader strategic issues such as the unrest in Syria and Yemen, a senior State Department official said. While in Doha, Kerry also will discuss security issues with Russia's Foreign Minister Sergei Lavrov. Their talks are expected to include efforts to combat Islamic State militants in Iraq and Syria, U.S. officials said, as well as the situation in Ukraine. From Qatar, Kerry travels to Singapore, Malaysia and Vietnam – three nations who have been involved in talks on the proposed Trans-Pacific Partnership to cut tariffs and trade barriers – and will also attend an forum in Kuala Lumpur organized by ASEAN, the Association of Southeast Asian Nations. While in Hanoi, Kerry will take part in an event marking the 20th anniversary of the establishment of diplomatic relations between the United States and Vietnam following U.S.involvement in the Vietnam War.